Festival Mediterranea is just about to start, and Maltese residents and tourists alike will be travelling to the neighbouring isle of Gozo to experience this celebration of Malta’s rich cultural heritage. This Malta festival, now in its eleventh year, will entertain, enthral and educate visitors with a diverse selection of attractions. Gozo is nicknamed the “Isle of Calypso”, and is believed by some to be the real world counterpart to the legendary Ogyigia, where the Homeric hero Odysseus was bewitched and held captive by the beautiful nymph Calypso. Visitors to this picturesque and tranquil Maltese island will surely find Gozo just as captivating in real life as it is in legend. The Gozo landscape boasts endless natural beauty, from green cliffs to the red sands of Ramla Bay, and that’s just the start… at this Malta festival, you’ll find a wealth of attractions to suit any preference. Malta’s upcoming Festival Mediterranea will showcase the best that Gozo has to offer, against a golden autumnal backdrop. 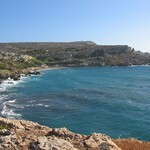 Gozo’s history stretches back through the ages, spanning at least 7000 years of tradition, music, heritage and art. The programme for 2012 boasts a rich and varied list of attractions and activities that are sure to appeal to a wide audience. The festival programme includes Gozitan opera and symphonic performances; immerse yourself in classics such as Madame Butterfly or join the audience at the annual Grand Concert, where the La Stella Philharmonic Band will treat you to their repertoire of traditional musical compositions. Sample traditional treats like Gozitan cheeselet, a flatbread filled with potatoes and goats-milk cheese known as Gbejna. Learn more about celebrated Gozitan artists like Giuseppe Cali. The 2012 Festival Mediterranea will start on October 25th and run until November 17th. The festival offers visitors from around the world the opportunity to experience this Mediterranean gem in a whole new light. Travel to Malta and Gozo this autumn, and lose yourself in this captivating Malta festival. Nicky Warner is a London-based blogger who plans to spend the first of many holidays Malta at the Festival Mediterranea this year.